IT HAS been a turbulent week for Jackie McNamara and the Dundee United manager has told how he has been forced to deliberately blank out the civil war surrounding the club for his own peace of mind. McNamara has found himself in the centre of a storm after admitting he earned a bonus from recent transfers involving Stuart Armstrong, Gary Mackay-Steven, Ryan Gauld, and Andy Robertson. The revelation came after fans’ groups questioned where £500,000 had gone from the club’s coffers. To make matters worse, United suffered a 2-1 defeat by Ross County last weekend to leave them without a win in the league since 24 January. United face city rivals Dundee at Dens Park tonight in their quest to save their season and win a place in Europe. McNamara says he has made a point of not becoming caught up in the on-going off-field storm surrounding the Tayside club’s transfer saga for fear it would keep him awake at night. “Instead I just focus on my job and preparing the team for matches. I’m focused on what’s happening on the park rather than what’s being said off it. “I was brought here to try and progress the club, so everything else that goes on takes care of itself. I’m here to prepare the players as best we can for games like the derby this week. I don’t think it affects the players. They’re focused on their jobs. “All anyone here is thinking about is the Dundee game on Wednesday night and trying to get a result for the club. A win would get us back talking about what we should be talking about – and that’s football. “Because we haven’t won for a few games everyone else has jumped on top of it. There’s an importance to this game because of the run we’re on. We need to get a result to settle everything down again and kick on with the eight games to go. McNamara has defended his own contract position which entitled him to a cut of profits from the sale of players to other clubs. And he insists anything which has gone on in the past week or so won’t unsettle his players going into tonight’s televised encounter. McNamara said: “What’s happened doesn’t change anything for me or the players.It’s personal from my side of things but it doesn’t change the way we go about our business preparing for games. We’re here to win football matches. That’s our job. It’s nothing to do with anyone else so it shouldn’t affect it. We’re professionals. 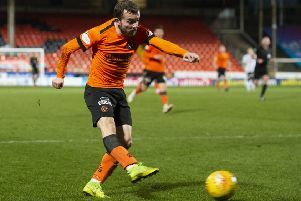 United face a revived Dundee side who could be breathing down their necks with a win at Dens, but McNamara is confident his side can rise to the occasion as they have done in the two previous league derbies this season, winning 4-1 at Dens Park and 6-2 at Tannadice. United also knocked Dundee out of the League Cup. He said: “Dundee are going well but people had them as favourites when we played them at the start of the season too. Matches like this come down to who keeps the head and takes their chances. United are likely to be without the injured Ryan Dow.